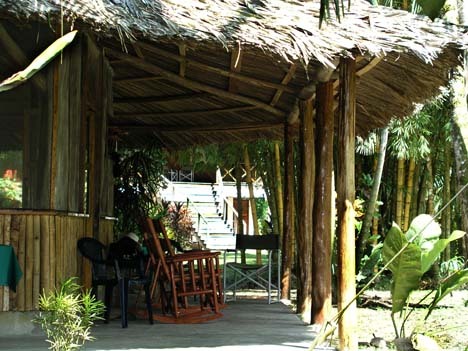 Jungle Tarpon Lodge is a small lodge holding up to 12 people. 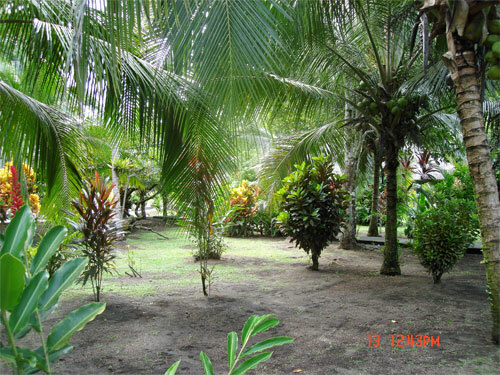 It is located in the Parismina area, on the edge of Tortuguero National Park. 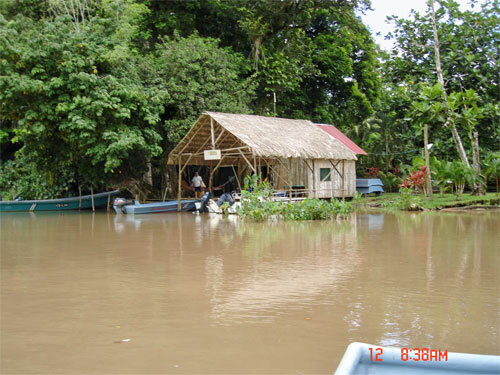 This is further south than some of the better known lodges around the Rio Colorado (close to Nicaragua). There are more smaller lesser know rivers in this area that are better suited to a fly rod. Being smack in the middle of eco-tourism paradise we can also entertain the non fishing member(s) of your family with numerous types of jungle, bird and turtle nesting tours. 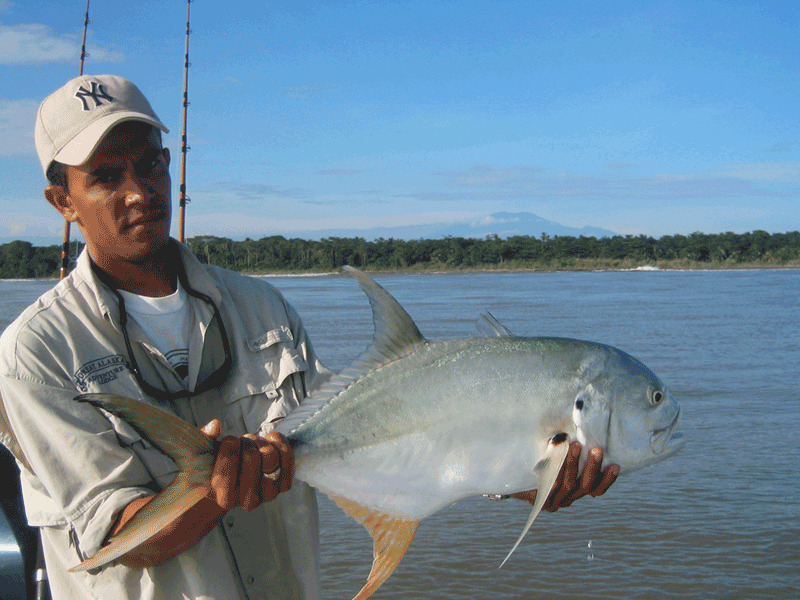 Our size means you will get more personal attention for both the fly fishing nuts and the jungle exploring eco tourists. 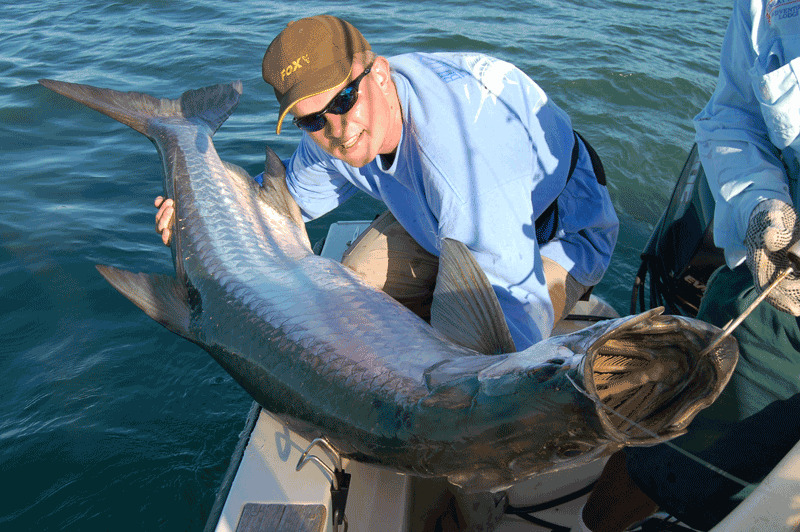 Spend a week fly fishing for tarpon here and we can guarantee action. 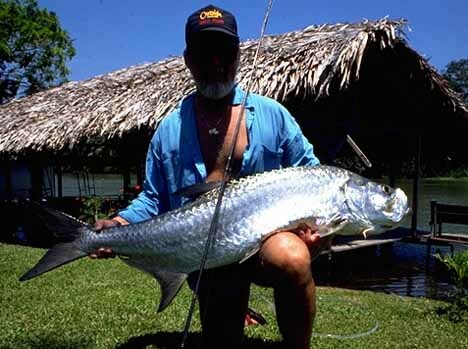 You will fish the rivers mouths for huge tarpon or the small creeks, rivers and lagoons for tarpon of every size. 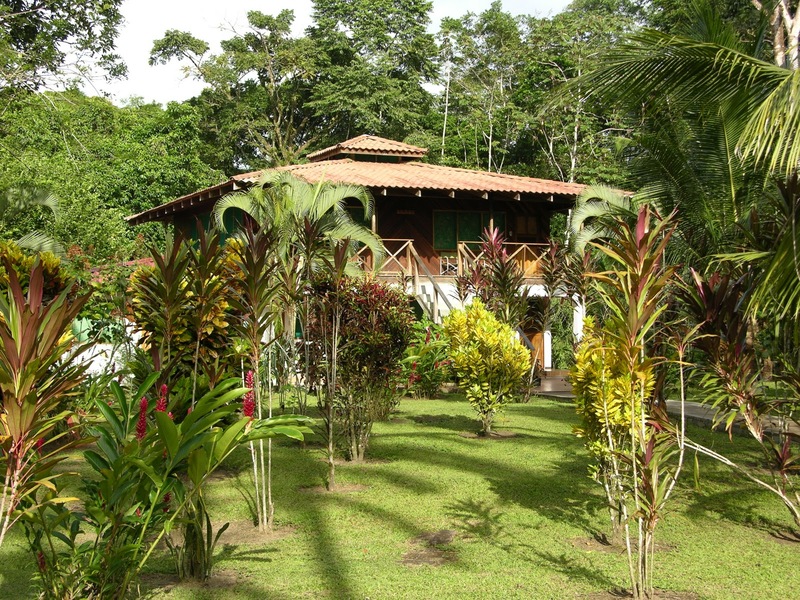 The lodge is in the middle of the jungle on 100 acres off preserve. You may wake at the saem time your neighbors do, the howler monkeys. 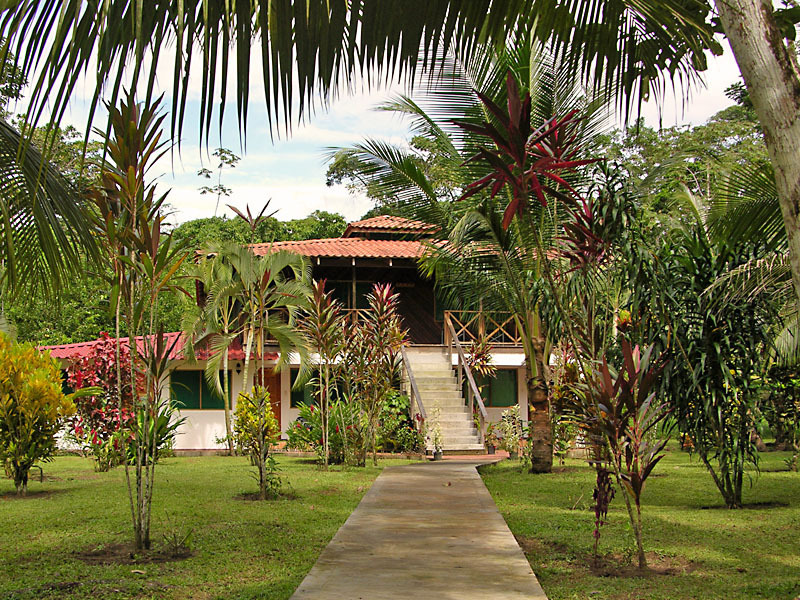 Just being on the grounds of the lodge is a jungle tour all its own. 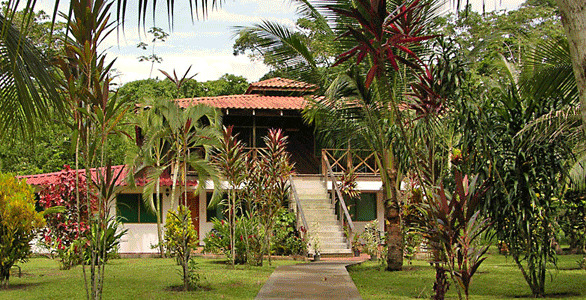 Your trip begins with your arrival in San Jose, Costa Rica. We will take care of you from there. You will be met by at the airport and taken to your hotel in San Jose. You will stay in San Jose that evening. Downtown San Jose has lots of shops, a casino, a beautiful restored theater and lots of things to do. 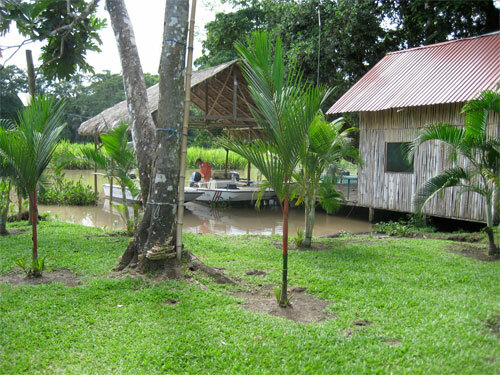 Depending on your itinerary, you will be flying to Parismina or taking the 3 hour van ride through the rainforest and then boat your way to Jungle Tarpon Lodge, your home for the next few days. Either way we start at 7am for the trip to the municipal airport or the drive/boat scenic route. 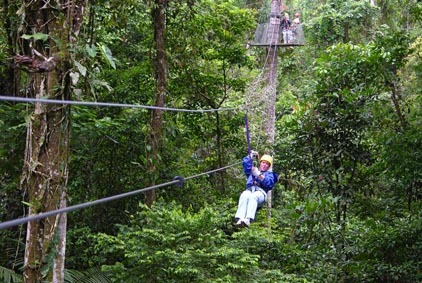 The scenic route will take you through the Cloud forest if you are not fishing you can make a day of it: ride the aerial tram up through around and back into the canopy of the rain forest; visit the butterfly farm and; get a close up look at some banana plantations. If you are fishing you go directly to the lodge. 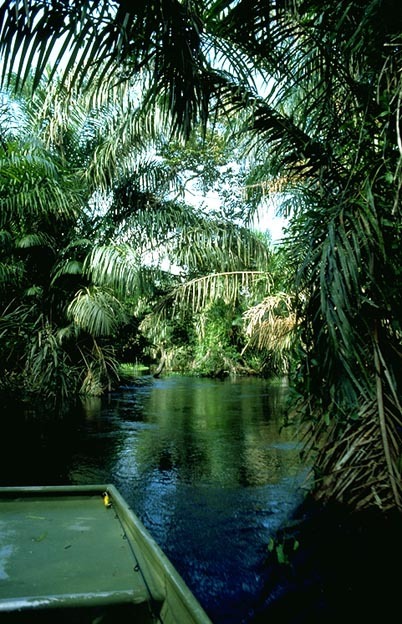 It is about a 3 hour drive to the town of freeman where you will board a river boat for the last 20 minute ride to the Jungle Tarpon Lodge. 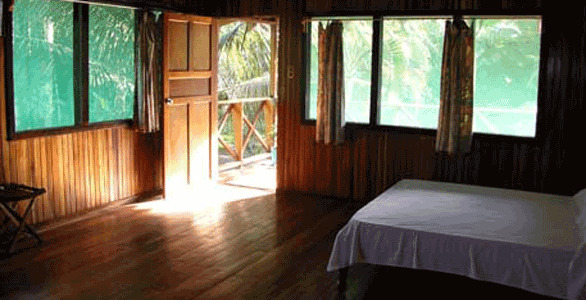 Once we get you settled into your room you will head out for a half day of fishing. Some of the best fishing is just minutes away. 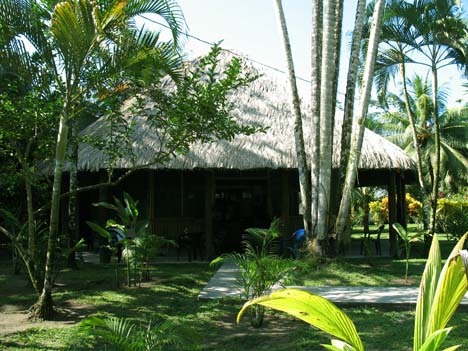 Dinners are served in the dining Palapa ( a large thatched roof building in the middle of the grounds. Depending on your flight home we will either bring you back to San Jose for the last night or head out on the morning of your departure if your flight allows. 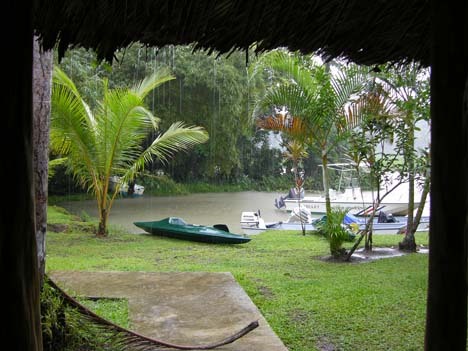 Jungle tarpon Lodge is on its own island surrounded by rivers or the ocean. 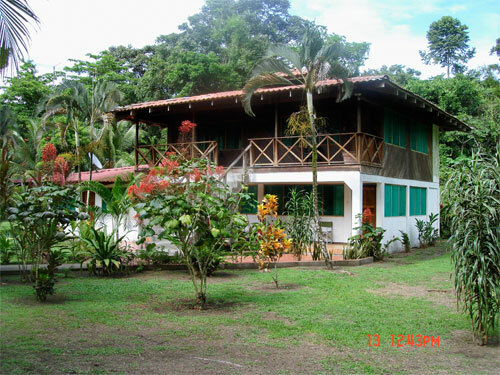 It is large enough to be the home of a large family of Howler monkeys. 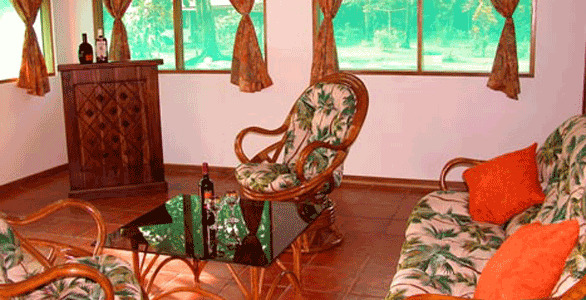 The main building has 4 rooms at the lodge that normally hold two double beds but they are large enough that they can each hold up to three beds quite comfortably. 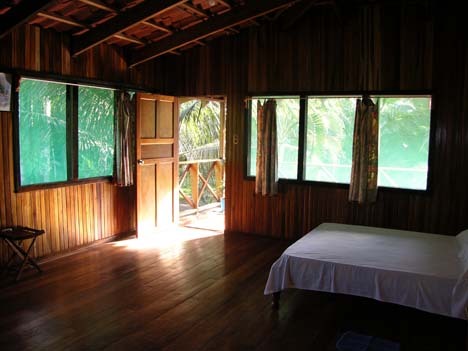 They are quie large and offer many windows into the jungle. 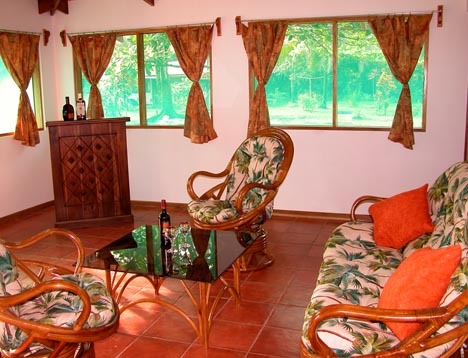 Besides windows galore, the rooms all have hardwood floors, ceiling fans, and a private bath with hot water. Electricity and the outlets are standard US voltage. 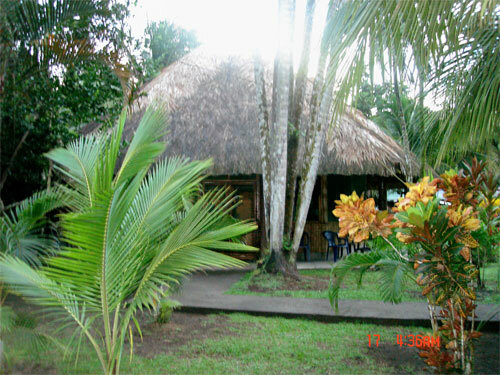 The lodge is just a few years old an the rooms are in excellent condition. 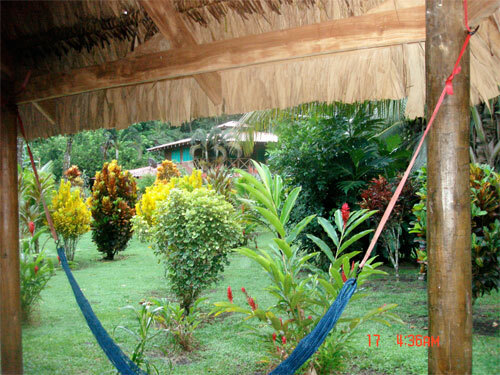 The grounds consist of the docks with living quarters for the guides, the dining palapa and the lodge. In any direction you turn you will see nothing but jungle, you will hear nothing but jungle sounds. This is really cool! The dining room has a bar and fully equipped kitchen. This is where all your meals will be served. It is a thatched roof structure with a tile floor and screened walls. There is an on site manager that will make sure your stay is as comfortable as you want. 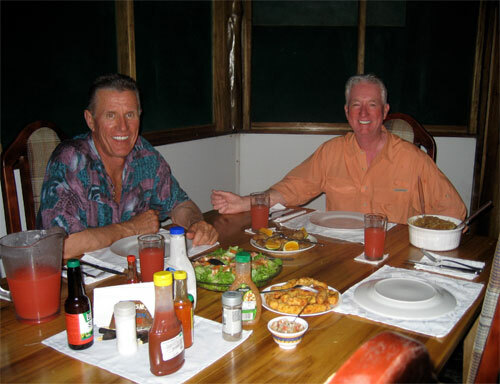 Meals are served in the dining room ( palapa) and are cooked fresh every day. We import fresh vegetables for all meals and I promise you will never go hungry! Breakfast is served at 5:30 am for the fishers in the group so we can get out early and fish. 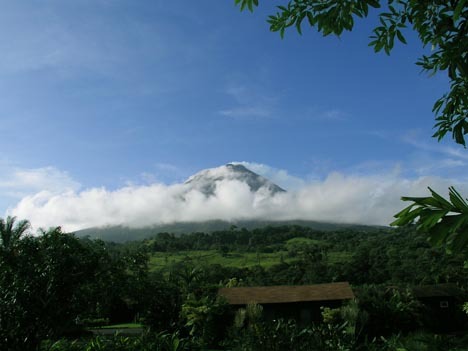 You will have no trouble knowing when it is time to get up because the howler monkeys will be in full voice at dawn! It is an other worldly sound! Breakfast will always include fruit and juice every day, with bacon or sausage, eggs, French toast or pancakes. Did I mention the Costa Rican Coffee? Mmmmm.. Depending on the day we can opt to stay out through lunch and come back in mid afternoon or fish in 2 sessions one morning from 6 till 11:30, eat lunch at 12:30 or so. A little siesta till 2 and its back out on the water till dusk. That is one of my favorite ways to do it as you hit both ends of the day which can be the best. You will get a full day in each and every day. We are here to fish. If that isn’t enough fishing you can get out in the surf and cast as long as you want! Dinner is served around 6:30 each evening. Full dinners are served with chicken, pork, seafood the main fare, complete with salad, vegetables, and the Costa Rican staple; rice and beans and of course dessert. 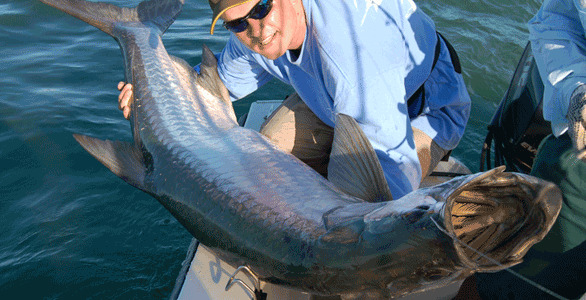 Tarpon fishing is the name of the game here although October brings in a huge run of trophy snook to the rivers. 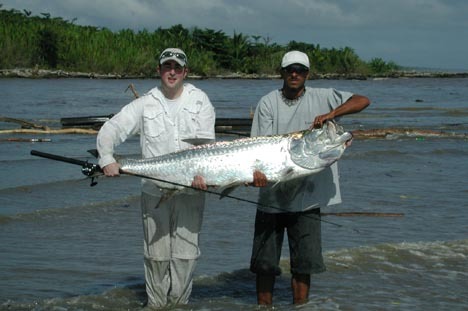 From the Rio San Juan at the border of Nicaragua through the Tortuguero area on the central part of the coast lies the most productive tarpon fishery in the world. 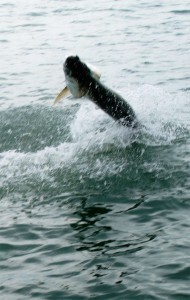 Tarpon reside here all year round and behave like the predators they are. 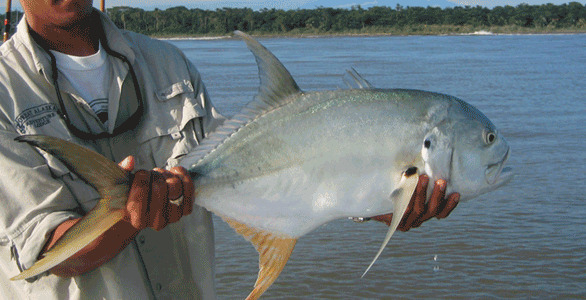 While some migrate to flats to mate these fish are here to eat so you will see fish busting bait quite often. 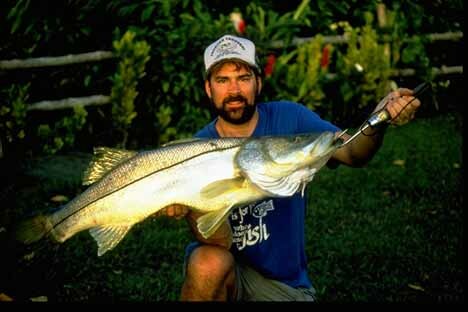 The snook are present year round but invade the rivers in October and November for added non-stop action. 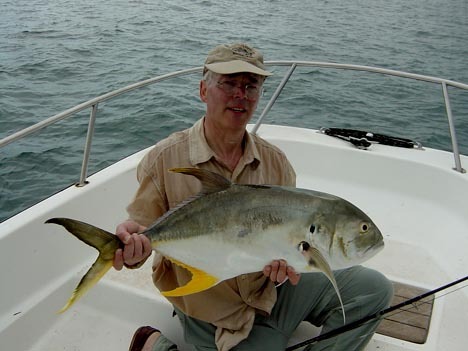 A few other species like machacha and guapote are often found on the end of your rod as well. 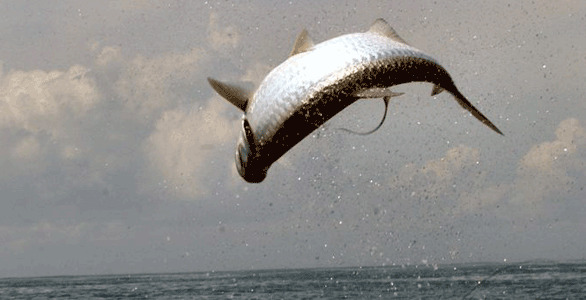 The largest tarpon are in the ocean with the average fish between 50 and 100 pounds. 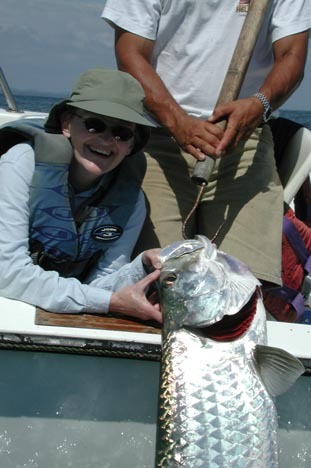 The largest fish landed here was 178 pounds! Imagine that much fish rocketing 6 feet out of the water, shake its head with its mouth and gills wide open and take off to do it again! ( that is if you haven’t dropped your rod in bewilderment!) 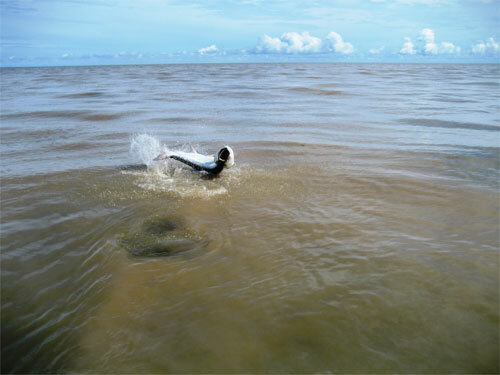 No other fish can really prepare you for that first big tarpon. 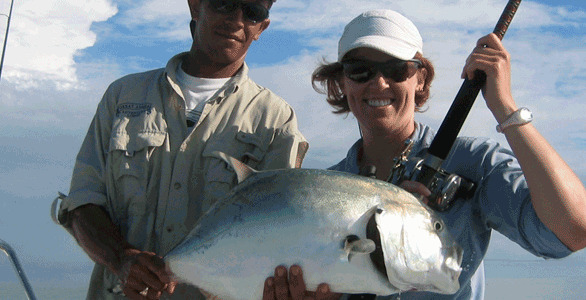 The fly fishing can be combined with conventional gear to increase your odds against these monsters. 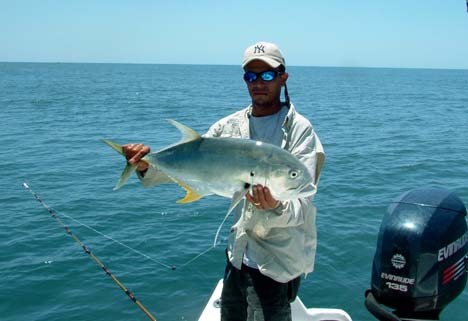 The ocean holds some of the largest specimens and the fishing can be on the surface with tarpon busting bait all around the boat ( this is the time the fly rod works best) or the fishing can be near the bottom in 30-80 feet of water! ( this is when the conventional gear works best) Since I love to fly fish so much I don’t mind going out in the boat and spending some time searching for these big tarpon even though I get less hookups than my friends with spinning gear. I think the saying goes there are people who can’t cast, there are people who can cast and then there are people who can cast when tarpon are in sight! 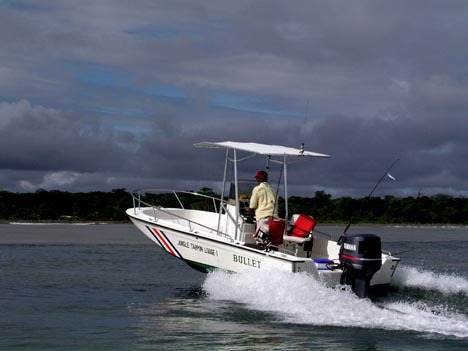 We fish the ocean in the comfortable offshore boats and use flat bottom john boats for the river. 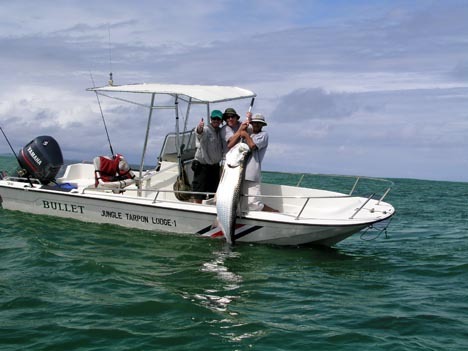 Ocean fishing is entirely dependent on the water conditions. It must be calm enough to safely get the boats out there. 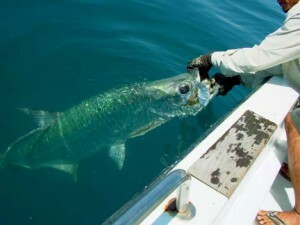 Most people end up using conventional tackle for the large tarpon most of the time. The fly rod can be extremely effective when your guide paddles into a feeding school but 80 % of the fishing will be in deep water. A very heavy shooting head can get down, it just means spending a lot of time letting it sink instead of fishing. Either way the end result will be the silver twisting, leaping machine throwing your fly/lure after the first jump. 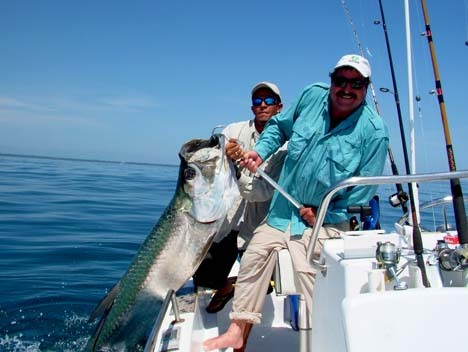 We also encounter Atlantic sailfish 40-80 pounds, tuna, wahoo, permit and Jacks are caught from the offshore boats as well. The river fishing is a little more straight forward for the fly rod with fish rolling and feeding in some of the quieter back lagoons but there are still areas of big holding water that can be 20 feet deep with a 3-4 mile an hour current. Now think of that same 60 pound uncontrollable tarpon with an extra 4 miles per hour of current attached! 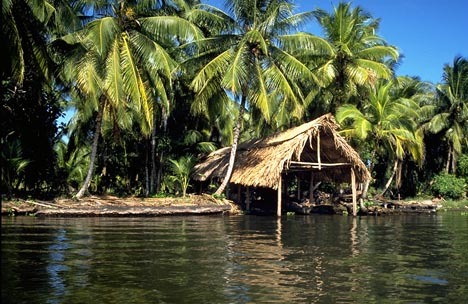 Lisa and I love the peace and quiet back on the rivers and lagoons. 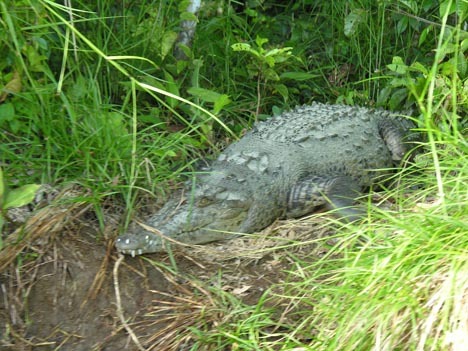 You will encounter monkeys, sloths, toucans, crocodiles or something on every excursion. 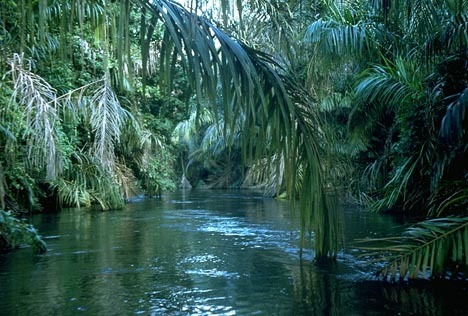 The thick jungle radiates with life. 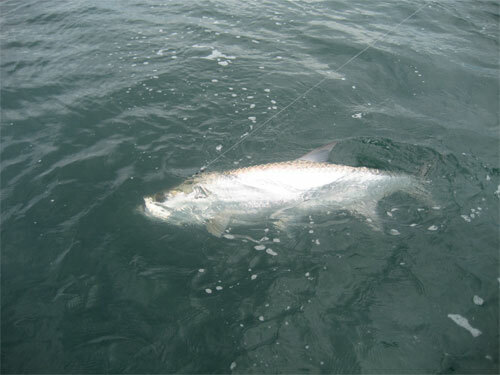 Smaller tarpon from 10-50 pounds are commonly found in the smaller rivers like Rio California while bigger fish can follow bait up some of the bigger rivers like Rio Colorado. 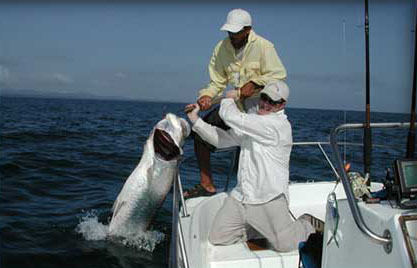 Guapote, Machacha and Snook are found year round. 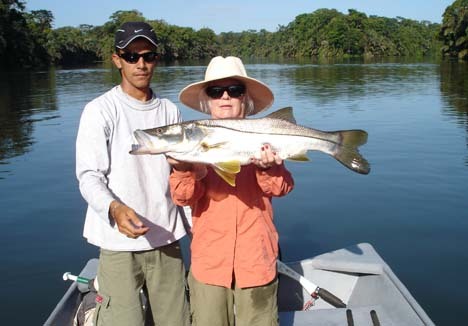 In the fall there is a huge run of large snook ranging from 5-30 pounds. 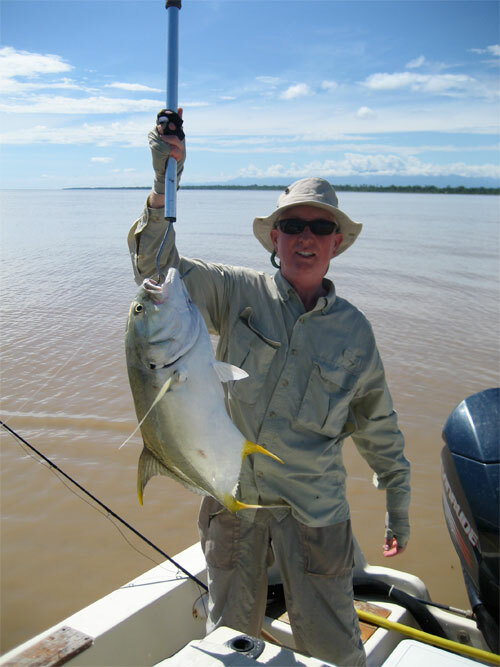 We have access to hundreds of miles of rivers from our central location near Parismina and our quick john boats. These smaller john boats can allow your guide to paddle and make a nice stealthy approach to a feeding fish. Some of the fishing is blind and some is casting to rolling fish. Very often you can entice these fish to the surface using poppers. You may be casting to what you think is a baby tarpon only to have a 60 pounder engulf your fly and leave you helpless on the end of your 8 weight! In the deep water situations the conventional tackle will be more effective but the patient fly fisher will be rewarded as well. #4 Full super fast sinking 9- ft leaders with 25-30 lb. class tippet and 80-100 lb shock tippet. 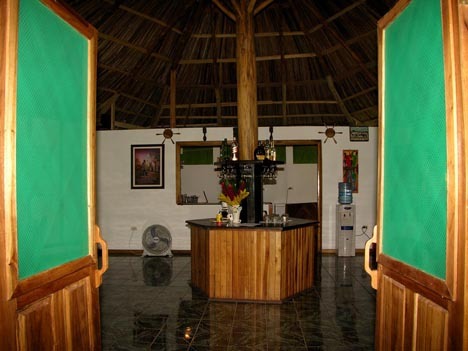 Prices Include: round trip ground/boat transportation from San Jose to the lodge, breakfast, lunch, dinner (except while in San Jose), all lodging -your first night will be in San Jose, guided fishing or eco-tours each day and taxes . 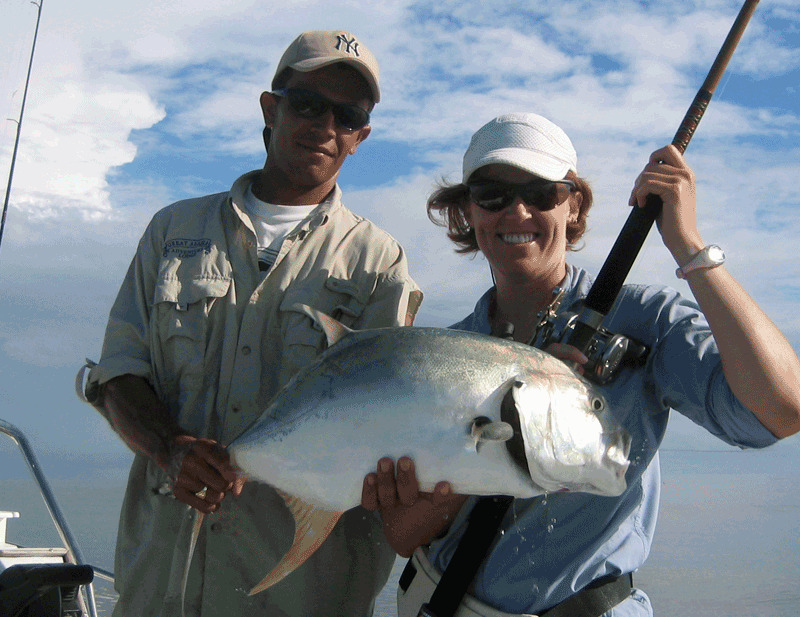 All prices are per person based on double occupancy for the room and the daily fishing trips. 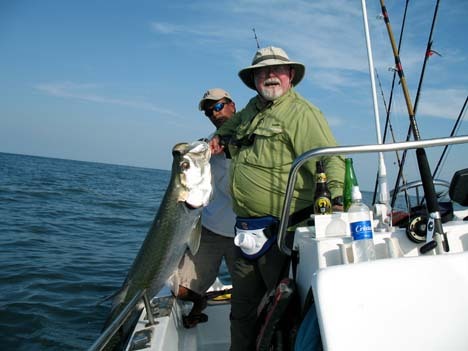 Prices do not include: fishing license, alcoholic beverages, sodas or a tip for your guide and lodge staff. 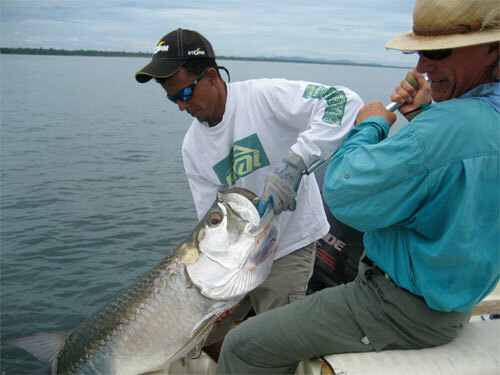 Please take a look at the photo and video galleries related to Costa Rica tarpon fishing at Jungle Tarpon Lodge. 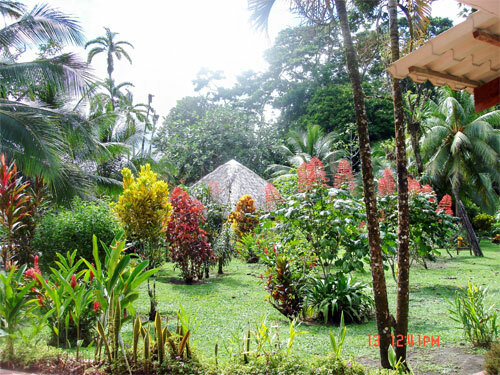 The Jungles of the Caribbean coast are fascinating. 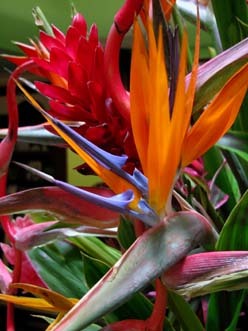 There are thousands of bird here with toucans and parrots the most flamboyant. 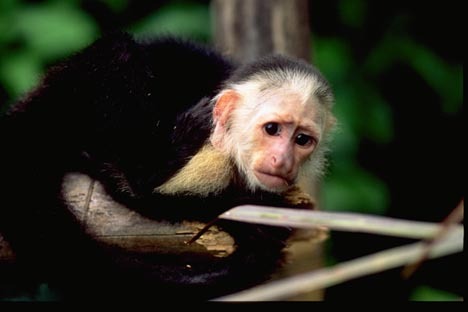 There are monkeys everywhere with crocodiles lurking about or sunning themselves on a sand bar. 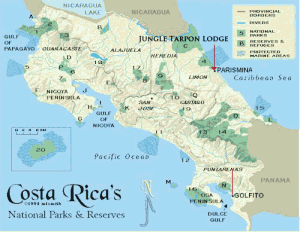 Costa Rica has the largest nesting population of green and leatherback turtles in the world. 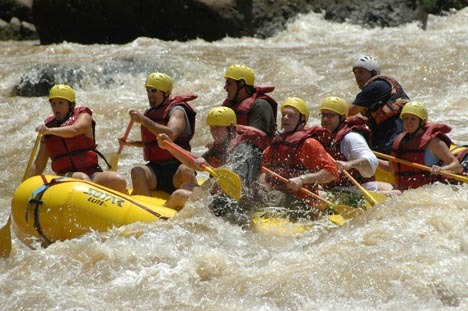 If you are looking for something else to do besides fishing there are a number of tours you can explore. 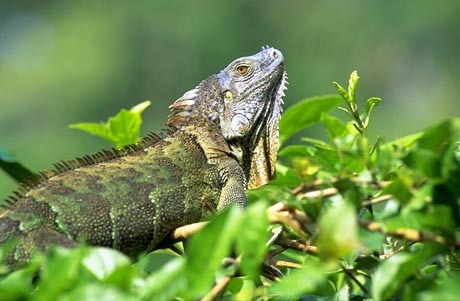 A walking tour through the jungle will bring you into the erie, lush green of the forest with tiny little bright red frogs, slow moving three toed sloths, monkeys swinging from tree to tree, beautiful birds, iguanas and countless other mammals and reptiles. Your guide will find things large and small that if left alone you would walk right by and never see them. Some of the hiking is on a “trail” while other times the guide will hack a path as he is off in the direction of some sound. Best to have waterproof hiking boots as there is a good chance you will slosh through some mud. On a canoe or kayak tour you will probably find a crocodile or two. 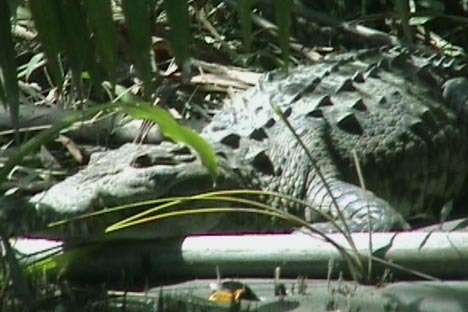 The large ones can be 10-12 feet and a baby is only 6 inches. Sloths are often hanging out in a tree overhanging the water, with howler, spider and white faced monkeys making a ruckus somewhere nearby. It is a very peaceful way to spend and afternoon. 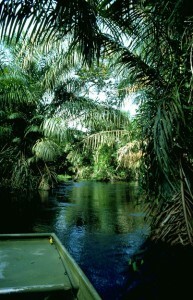 Some of the lagoons lead to little canoe “trails” that wind through the jungle. Every turn reveals something new and fascinating. 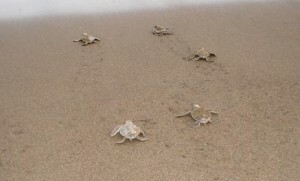 Starting in March turtles flock to the beaches to lay their eggs. The season last through July. First the leatherbacks come in with the green turtles following in May. Witness this ancient ritual and actually see the babies making their way back to the ocean. These are walking tours conducted by our guides at the lodge. Strict licensing of guides has been introduced t o help minimize the impact we have on their nesting behavior. You will most likely encounter turtle mating in the ocean if you are fishing during these periods as well. 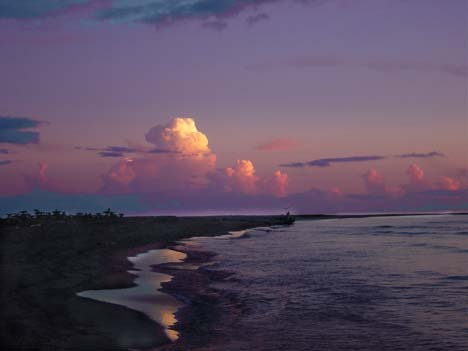 The beaches in this coast are made up of very fine volcanic sand. Dark gray in color, they are like no other beaches you have seen. 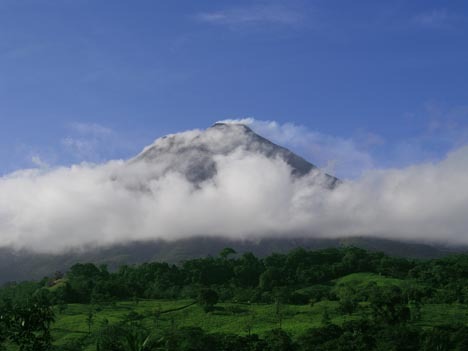 You will need to fly to San Jose, Costa Rica (SJO) Many airlines service SJO. After arrival in San Jose, please take a taxi from the airport to the Hotel Presidente (downtown), there are paid reservations under your name. The next morning you will be picked up by our driver at 7:,00 am on day 1 of your jungle tarpon trip. There is a great breakfast in the hotels cafe and the driver will call up to your room to meet you. 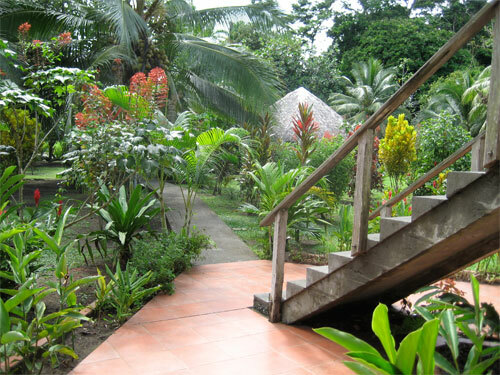 Prepare for the beautiful 2 1/2 hour site seeing tour of Cloud Forests and a banana plantation before arriving at the boat for the trip up river to the lodge. You will return to San Jose by van following lunch on your last day on the Caribbean. No vaccinations are required, please see the CDC or your doctor. Please inform us of any health or diet concerns. The Hotel Presidente is a good, downtown hotel, where most guests will stay. flights out of Houston, Dallas or Miami. which can be changed at the airport – approximately 320 per dollar.